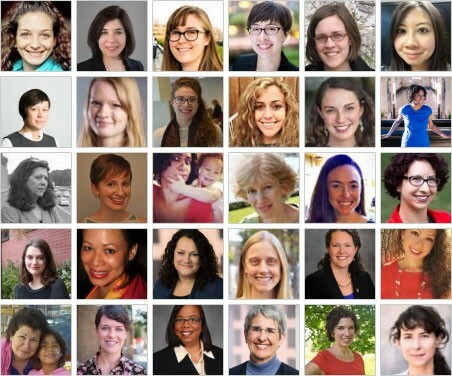 While the women of the Greater Greater Washington community tend to be outnumbered by men, the voices we bring lend diversity, inclusiveness, and expertise to our conversations. A quick tour of our contributor listing shows 94 people who have authored posts in the past few months; 32 of those contributors are women. I've been involved in GGWash since 2008, when a woman I met on Twitter, Jaime Fearer, reached out to me, befriended me, and brought me in to the community. Jaime was one of our earliest day editors (a precursor to today's editorial board), and her voice and commitment played a huge role shaping Greater Greater Washington's coverage of local elections and writing style. Without her early behind-the-scenes leadership, GGWash wouldn't be what it is today. Sarah Guidi, our Managing Director, is the phenomenal woman responsible for setting our organization's strategic direction, managing the budget, raising enough money to pay our staff, systematizing the systems of our growing organization, coordinating our board of directors and editorial board, and so much more. Her tireless dedication, relentless attention to detail, and patience keep us going every day. She's also become my close friend and colleague in her year-and-counting on the GGWash team. Sarah Guidi at GGWash's 8th birthday party. Image by the author. 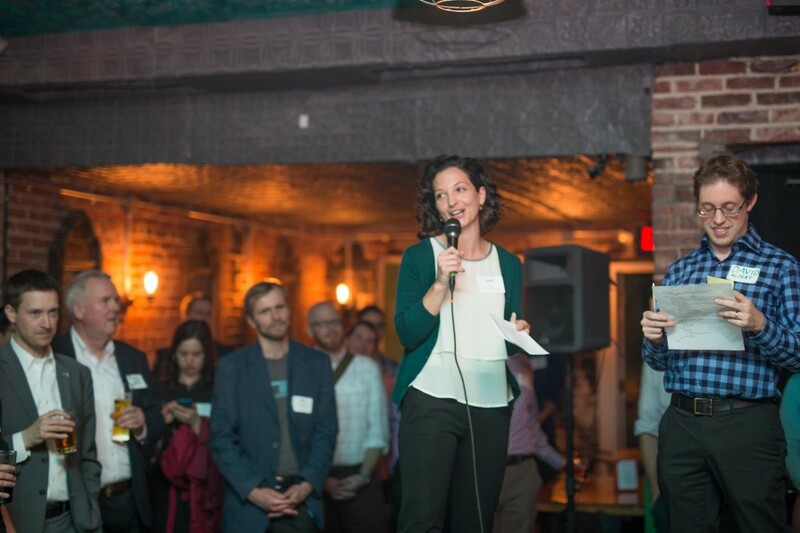 As Greater Greater Washington has grown, we realized policy analysis and commentary, and fundraising and organizational development, weren't always overlapping skill sets. Abby Lynch joined the board of directors specifically to lend her skills in fundraising; you may not see her byline on the blog very often but we wouldn't be where we are today without her. Miti Figueredo has also lent her valuable expertise, time, insights, and connections to our board and now serves as board secretary. More than you may realize, Breakfast Links are also brought to you by women. Kelli Raboy and Joanne Pierce, and before them, Abigail Zenner, are working tirelessly to refine our breakfast links format, recruit, train, and coordinate our breakfast links writers, and edit the daily links to bring you the best of the news every morning. Nicole Cacozza is part of our crack team of curators who read the news and write the link sets. 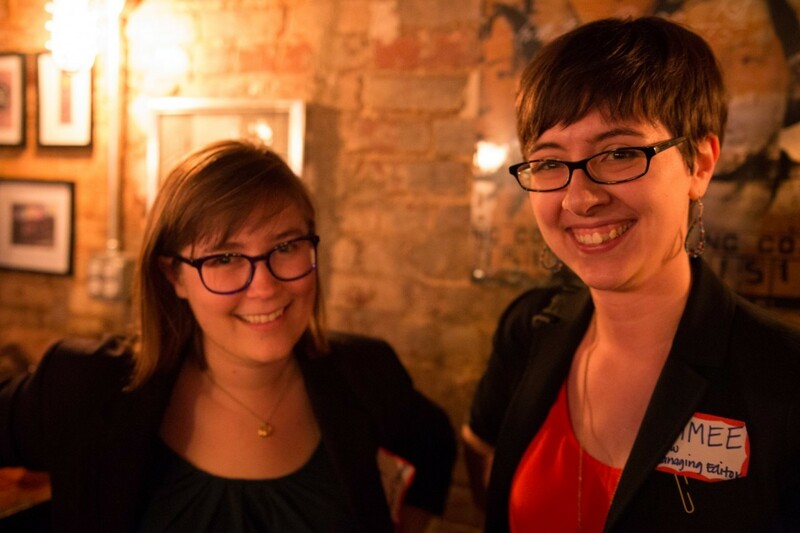 Abby Lynch and Aimee Custis at GGWash's 7th birthday party. Image by Kian McKellar used with permission. Aimee Custis (editorial board) is a wonk, communicator, and Deputy Director of the Coalition for Smarter Growth. Her writing represents her own views, though they’re often aligned with her employer’s. Weekends, you’ll find Aimee at home in Dupont Circle or practicing her other love, wedding photography. Jacqueline Drayer is the Community Outreach and Grants Manager for the DC Preservation League. She loves wandering Eastern Market and lives in Glover Park. Miti Figueredo (board of directors) is the Director of Public Affairs and Communications for the Purple Line Transit Partners, which will design, build, finance, and operate the Purple Line. Previously, she served as Vice President for Public Affairs at the Chevy Chase Land Company, as Chief of Staff to Councilmember Nancy Navarro, and as Senior Legislative Aide to Councilmember Roger Berliner. She is a graduate of Northwestern School of Law and lives in Silver Spring with her husband and two children. Sarah Guidi is Greater Greater Washington's Managing Director. A social worker by training, Sarah brings knowledge of nonprofit management, policy and advocacy, and community engagement to Greater Greater Washington. When she's not working, she enjoys visiting new parts of the city by bike, doing gymnastics, and reading novels. Sarah lives near Meridian Hill (Malcolm X) Park. Tracy Hadden Loh loves cities, infrastructure, and long walks on the beach looking for cool shells. She holds a Ph.D. in city and regional planning from the UNC-Chapel Hill. By day, she is a senior data scientist at George Washington University. By night, she is an activist, a military wife, and a baby mama. She served two years representing Ward 1 on the Mount Rainier City Council in Prince George's County, MD. Kristen Jeffers is new to DC, but not new to the world of blogging and transportation. Six years ago, she started The Black Urbanist to share her thoughts on transportation and urban design. She's a native North Carolinian, and after a hard look at the map, she’s determined that where she lives is really Park View after all. Jenifer Joy Madden is a multi-media journalist and founder of DurableHuman.com. Vice chair of the Fairfax Co. Transportation Advisory Commission, she was instrumental in the Tysons Metrorail Station Access Management Project and planned a multi-purpose trail system that connects to Tysons. Joanne Pierce (editorial board) is a Northern Virginia native and a graduate student in public administration and policy, focusing on resiliency and emergency response. She lives in Alexandria and enjoys learning about pretty much everything, including the history of pencils. Kate Rabinowitz is the creator of datalensdc.com, a website dedicated to visualizing the District through data. She resides in a Capitol Hill alley home and enjoys data mining, board games, and wandering city streets. Kelli Raboy (editorial board) works as a federal contractor supporting research on vehicle automation and communications. She loves all things cities, public transit, and rail. She lives in Navy Yard. Jessica Raven is a local activist and mom, raising one toddler and one cat in Bloomingdale. She is the Executive Director of Collective Action for Safe Spaces, a grassroots nonprofit working to make public spaces safer for everyone. Abigail Zenner is a former lobbyist turned communications specialist. She specializes in taking technical urban planning jargon and turning it into readable blog posts. When she’s not nerding out about urban planning, transportation, and American History, you may find her teaching a fitness class. Her blog posts represent her personal views only. Eve Zhurbinskiy is a third-year student at the George Washington University, and has been an Advisory Neighborhood Commissioner in Foggy Bottom since September of 2015. A New Jersey native, she is passionate about reproductive justice and engaging students in local advocacy. Here's to you, fellow women of GGWash. Gentlemen, we have a lot to say. Take a moment, won't you, to read something one of these women have written? And, of course, share in the comments your own salutes to the women in our community.